This morning Robert Cooper from the Bristh Lung Foundation received a cheque from the children of King's Road from £1200, in memory of Mrs Barnes. Sharon Barnes was connected with King's Road for over twenty years as a parent, a Governor and as a member of staff. 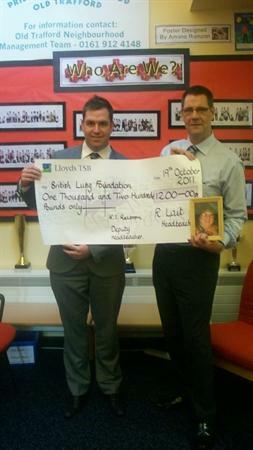 We are very proud to make this donation to help people with lung disease in the northwest of England.